Some gameplay links may be included if it demonstrates game features but duplicates (such as multiple gamescom demo footage) will be omitted. I intend to hold to a high standard of sourced information from professional channels, so videos covering wishlists, glitches, "I heard" or "reportedly" paraphrasing or rumors will not be included here. Feel free to post links to relevant articles and include Title, Author, Date published, url, Twitter link, topics covered. Feel free to ask clarifying questions, but use other threads for discussion so that users can find information here easily. I will include Calendar and anticipated dates as a heads up to watch for news but these are based on previous history and not official until announced. The official Forza livestream channel is www.mixer.com/Forza which is often simultaneously streamed at www.twitch.tv/Forza (this channel has stream replays going back to 2013). Regular streams are used for showing off new game challenges and playing multiplayer with viewers. Major announcements are usually not included in the regular streams but there may be summaries of the week's news, and special streams for first looks at DLC. See my www.bit.ly/ForzaCalendars at www.ManteoMax.com for a history of everything Forza and future racing and automotive expo dates. "Take the lead with the launch of #Forza7 on October 3! #Xbox"
"The ultimate racing experience. Built for 4K. 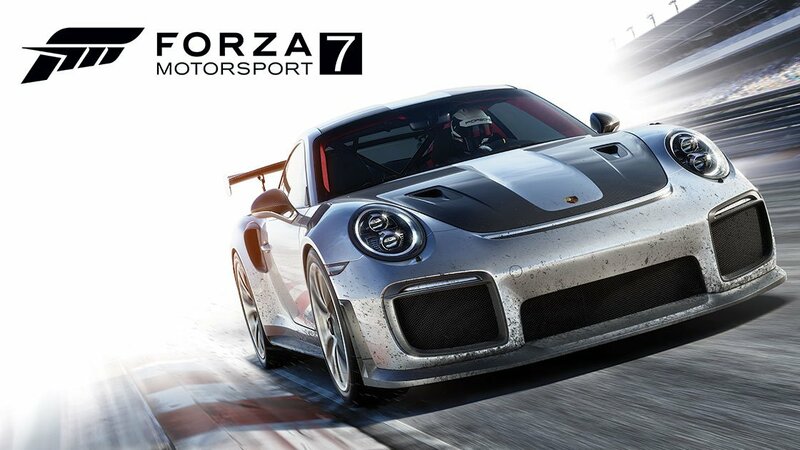 @ForzaMotorsport 7 arrives October 3. http://xbx.lv/2rkEaJl #Forza7 [RP] #XboxOneX"
Thanks to our loyal fans, the Forza franchise is home to over 4.8 million active users per month, making it one of the largest racing communities in the world and the premiere gaming partner to the automotive industry. - true 4K and 60fps, HDR and "race conditions that change each time you return to the track"
- "players can personalize their appearance with a massive race gear collection that includes hundreds of options spanning decades of race history and pop culture." - "thanks to the Forza Racing Championship esports league, enhanced spectating modes and Mixer integration, everyone can compete." Now available for pre-order at your local Microsoft Store and microsoft.com, Forza Motorsport 7 arrives worldwide on October 3 exclusively on the Xbox One family of devices and Windows 10 PCs via Xbox Play Anywhere. Special editions include the Deluxe and Ultimate Editions, complete with exclusive, digital-only bonus content, VIP membership, and access to the Day One Car Pack. In addition, Ultimate Edition owners will receive early access to the game on September 29 and the Forza Motorsport 7 Car Pass that gives you access to upcoming car packs. If you’d like to get involved in the Forza community before the launch of Forza Motorsport 7, we invite you to tune into the finals event livestream on Mixer, Twitch or YouTube on June 17-18. 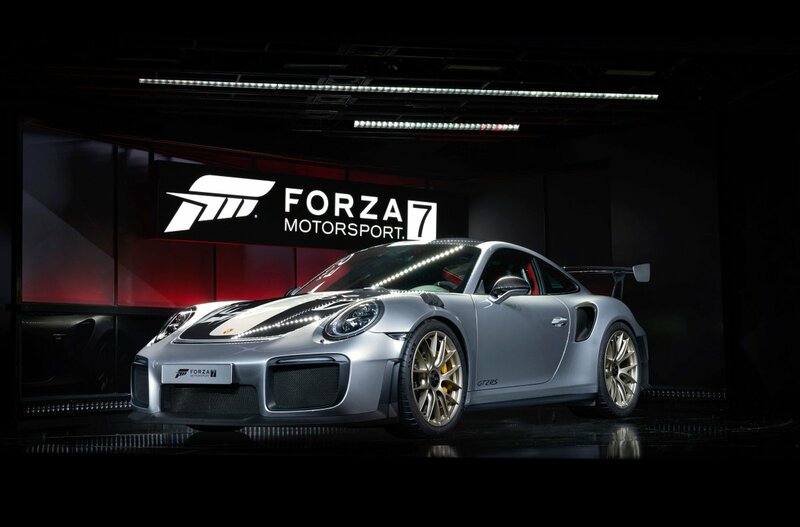 -"...addition of customizable characters...over 300 character designs"
In fact, the GT2 RS is the cover car for Forza 7, which comes out this fall on Project Scorpio, PC, and Xbox One. And while test mules of the car have been spotted (and even driven) for months, this was the first time the public’s seen the final thing. Article includes E3 stage reveal photos, and game cover art for standard and Ultimate editions. Microsoft and Turn 10 studios have officially pulled the wraps off of Forza Motorsport 7, the first Forza designed to run on Xbox One X, Microsoft’s next-generation console. Last month, I went to Turn 10’s offices to see Forza ahead of its E3 debut. I spent a little under 30 minutes playing the game, and the rest of the trip speaking with the team that brought it to life. Pics: official screenshots from FM7, a photog pic of Turn 10 Studios. Well, for one thing, this will be the first full Forza title available on PC. One particular new option is a “friction assist,” which lets the player turn up or down how severely they’ll be affected by driving off track. Forza Motorsport 7 was just announced at E3, and we’ve got an exclusive first look at the game, which you can see above. The first Forza for Microsoft’s new Xbox One X will take advantage of the console’s boost in power to run natively in 4K at 60 frames per second. The 5-minute clip shows off what that looks like with a quick race in a Nissan GT-R at Nürburgring. That clip also shows off something else: Forza Motorsport 7 finally brings dynamic weather to the series. "Watch a Nissan GT-R race in Nürburgring in this gameplay video from Forza 7 captured off Microsoft's Project Scorpio." 6 minute interview. 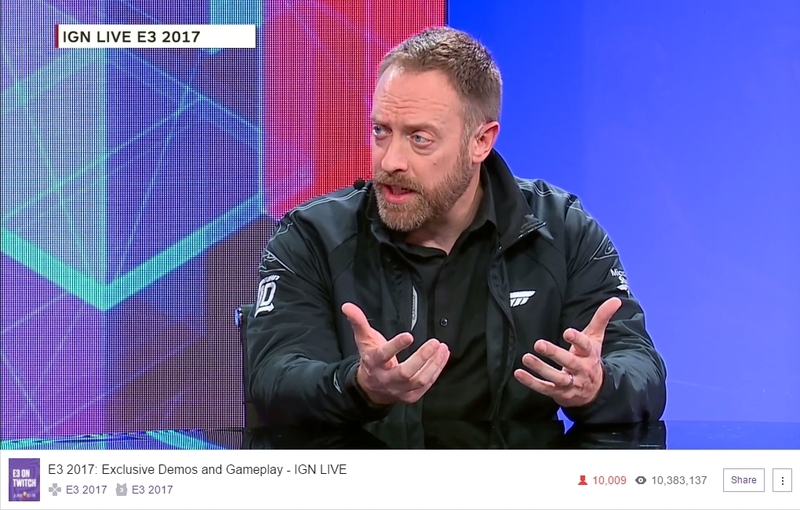 Bill Giese talks with Geoff Keighley about resolution, fps, HDR, touching up all 700 cars , "over 30 environments" including Dubai, Maple Valley, Mugello (part of the E3 show floor demo), buying for Xbox One S doesn't need to rebuy for Xbox One X, photogrammetry, two sleds showing the demo at E3 on "ultra 4K PCs", Forza Racing Championship, brand new leagues, spectating tools, Mixer integration. Quotes from Alan Hartman, Dan Greenawalt, and Chris Tector about designing for the One X abilities and PC. 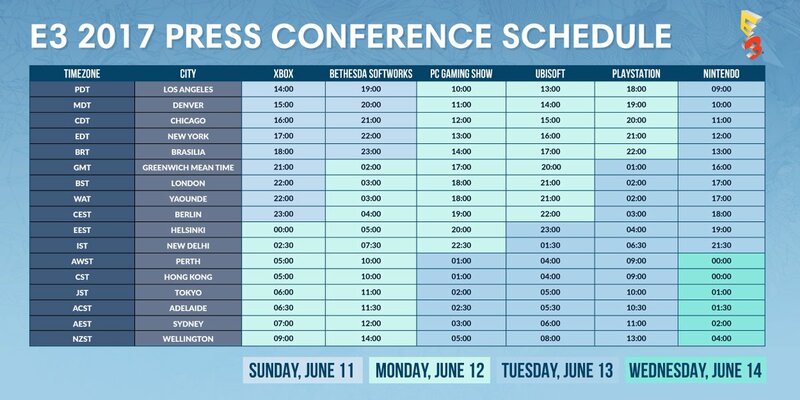 They have an Xbox One X showcase before that at 11:30 AEST (6:30am Pacific) which could also feature Forza 7. 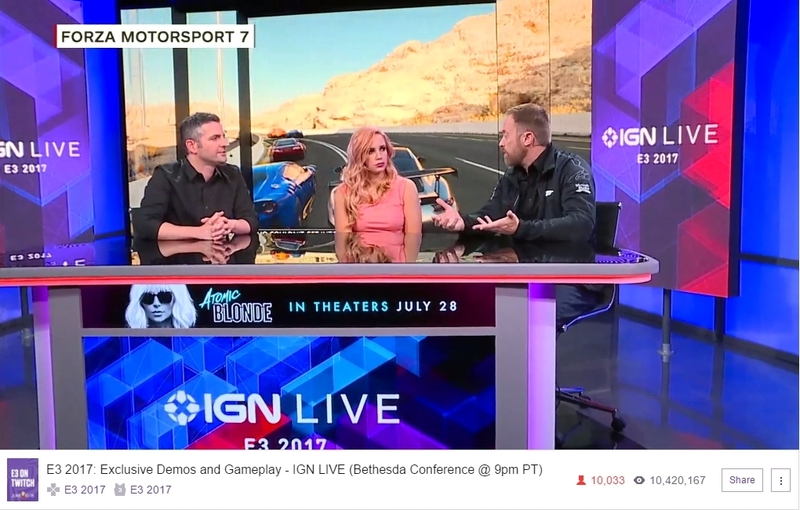 #Forza7 coming up on the @IGN #E3 livestream in just a moment. Make sure to tune in everyone! The dynamic features are available on all versions of the game, even minimum spec PC's. Sunday was the big reveal for Forza Motorsport 7 and the new Xbox One X. We were lucky enough to not only be there for the official announcement but we were also able to speak with Turn 10 Creative Director Dan Greenawalt at a special Xbox One showcase afterward. As per tradition we decided to use our time with Dan to ask him questions directly from the Forza community submitted via the official Forza Motorsport Forums. How did you pull off the Porsche 911 GT2 RS reveal? What is your vision for Forza 7? How is it better than Forza 6? What about the career mode? How will it be different? Will there be VR support on Xbox One X? Will multiplayer matchmaking include searchable custom public lobbies? Does the game allow for gifting cars, credits, etc to other players? Will you introduce strategies to encourage cleaner, fair online racing and penalize ramming & corner cutting? Will there be off-road rally stages or rallycross tracks? Are widebody kits, and wheels from Forza Horizon 3 coming to Forza 7? Anything you want to say to the Forza community? Exclusive cars, Mods, Driver Gear, and more await with Forza Motorsport 7 VIP membership! 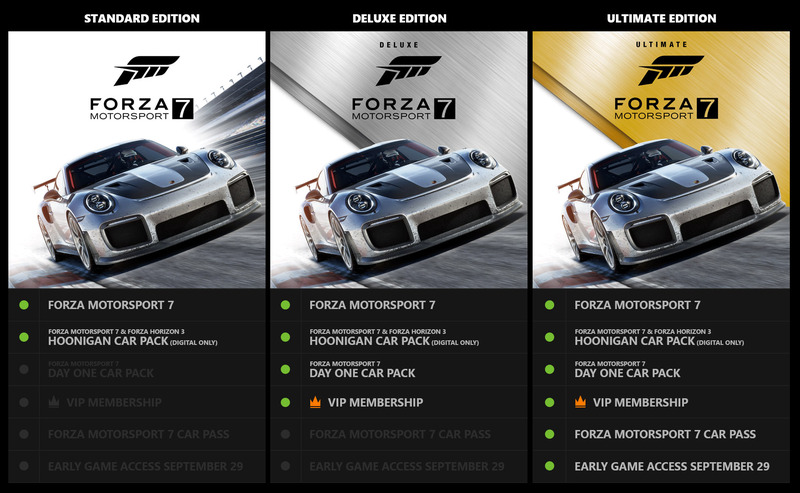 Forza Motorsport 7 VIP members receive exclusive VIP cars as well as additional benefits including bonus Mods, VIP Driver Gear, and more. Look for more details on these offers soon! Today, the doors to E3 2017 are open and we’re giving you an inside look at the Forza Motorsport 7 demo that is running on the show floor on actual Xbox One X hardware and for the rest of the week. For those of who can’t be at the show in person, consider this your in-the-cockpit tour of the biggest racing game in Forza history. 2015 Nissan #1 NISMO Autech GT-R & Nurburgring GP circuit in the rain, puddles, lightning and thunder. "Welcome to dynamic track conditions in Forza Motorsport 7." "By Lap 2, the rain has gone from “terrifying” to “merely frightening” and, look!, is that a glimpse of sun in the sky in the distance? The rain might have let up but you’ll still need to deal with the effects of the downpour, including puddles that remain on the ground and the slippery conditions that result. You’ve outlasted the storm and evening is approaching on the Ring." "we’ve improved the look of Forza 7 on every platform, whether you’re enjoying the game on Xbox One or a high-end Windows 10 PC, on a current 1080p TV or a state-of-the art 4K set." dynamic race weather systems - "Every time you return to the track, it’s going to look, sound, and feel different. Dynamic skies will churn as skies darken and prepare for storms. Tarmac temperatures will change which will in turn affect tire friction and your car’s handling. Lighting will flash across the sky and rolling thunder claps will accompany every pop and growl of your car’s engine. " Showcase events "where some of the most exclusive reward cars will live"
Tier levels - "In essence, the more cars you collect, the greater your post-race rewards will be." "We’ll have more to say about our car collecting system at Gamescom." crossplay for Xbox One, Windows 10 PC, or Xbox One X. Look forward to more details coming out of E3 2017 this week, and of course, more details on the game throughout the summer as we lead up to the October launch. Remember, you can pre-order the game now. If you can’t get enough of Forza 7, check out our hands-on report of the E3 2017 demo. Look for more reveals of features, cars, tracks and more as we roll through the summer and stay tuned to @ForzaMotorsport for the very latest Forza Motorsport 7 news. When speaking with the team at Turn 10 Studios, there’s three main things they want to make clear about the direction of Forza Motorsport 7. 1) This is, by far, the best-looking game they’ve ever made thanks to the power of Xbox One X, 2) Critically examine the series’ history to completely re-imagine the campaign, and 3) Unifying the largest racing community across the Xbox family of devices, including the series coming to PC for the first time via Xbox Play Anywhere with cross-play on Windows 10, and a wide range of racing peripheral support on PC (time to dust off that racing wheel that’s sitting the garage). ...."dynamic cube maps, image based lighting system, updated car materials..."
One of the most impressive visual features is the photogrammetry technique, allowing them to use photo references to build up the modeling and texturing in the game. So, for example, when you’re driving on the Dubai Circuit of the Emirates track (shown to us for this specific demo), you’ll see the actual rock formations where they are in real life alongside the course, in addition to other more subtler features like wind blowing sand across the track. puddles expand, lightning, an in-cockpit steering wheel-less view, "Showcase events — one-off racing events that are uniquely designed to allow you to earn exclusive cars — make a return, as well as earning XP during races," better rewards based on car collection, "Every time you level up, you gain a milestone reward that can be in the shape of cool driver gear or discounts of cars." We sat down with Dan Greenawalt, Creative Director of Forza Racing Franchise, to talk about how Forza Motorsport 7 is from the ground up to push the racing genre forward. Franchise Creative Director Dan Greenawalt from developer Turn 10 Studios came by our booth to talk about the game, the improvements over Forza 6, and how Xbox One X helped influence development. Check out the full video interview below. The news was shared by Forza Motorsport 7 Creative Director Bill Giese in a behind-closed-doors session of the game attended by AR12Gaming. Groove Music integration, #Forzathon, Auction House, and Mod Cards all confirmed. More info about Online, new "Collection Tier" system that replaces wheelspins, etc. "YoungRhombus? That sounds like the name of either a fledgling math student or a rapper." Why has everything news related stopped? The week in review is the last thing posted. 2013 HRPT long hauler in my 45th Anniversary SS!! !